Denny Hamlin piloted the #11 FedEx Office Toyota to a 15th place finish at Pocono Raceway in a rain-delayed Good Sam RV Insurance 500. Running well for most of the day, Hamlin led a race-high 65 of 200 laps. A stumble during a late pit stop sealed the FedEx team’s fate as they pushed for a top-five position. Brad Keselowski took the checkered flag for his second win of the 2011 NASCAR Sprint Cup Series season. 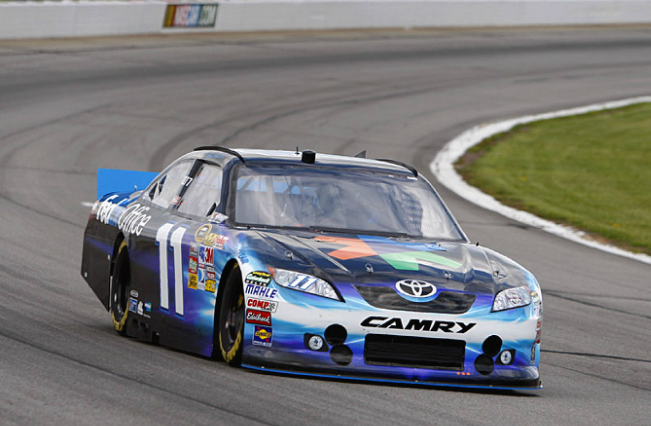 Hamlin’s Joe Gibbs Racing teammate Kyle Busch came in second. Kurt Busch, Jimmie Johnson and Ryan Newman rounded out the top five. Fellow Joe Gibbs Racing driver Joey Logano finished 26th after starting the day on the pole. Hamlin has historically run well at Pocono, with four wins in 11 races going into Sunday’s race. The FedEx team came into the day hoping to boost their position in the Chase for the Sprint Cup standings with six races remaining before the field is set. Hamlin started the day on the outside of row three on the 2.5 mile triangle course. An early caution flag on lap 12 brought the #11 FedEx Office Toyota to the pits for fuel, fresh right side tires and a left rear wedge adjustment. A second yellow flag quickly followed on lap 20, but Crew Chief Mike Ford kept Hamlin on the track. Shortly after returning to green flag racing, Hamlin claimed the lead on lap 25. Lap 40 brought Hamlin to pit road for a fast stop under green flag racing. As the field cycled through pit stops, Hamlin was able to regain first place by lap 44. A second pit stop in the same stretch of caution-free racing came on lap 64, in which Hamlin was again able to reclaim the lead a few laps later. Hamlin held the lead through lap 102 when the team was forced to pit for fresh tires, fuel and a wedge adjustment under a yellow flag. Intermittent light rain finally gave way to a steady downpour that brought a halt to racing on lap 125 with the FedEx team in third place. After a nearly two hour rain delay, the field came back under caution to resume lap 125. As many drivers came to pit on lap 129, Ford called the #11 car in for several adjustments to go along with four tires and fuel. Green flag racing returned on lap 131 and Hamlin filtered out in eighth place. Hamlin maintained a top-10 position through two pit cycles until the team encountered some bad luck during a late-race pit stop on lap 180. As the team attempted to put on right side tires and get the fifth place car quickly back out onto the track, a lug nut came loose. The delayed stop dropped Hamlin to the middle of the pack and out of contention. With the result, the FedEx team stands 11th in the points standings going into next weekend on the road course of Watkins Glen.